Antonio Villaraigosa called for three successive voice votes before announcing that Democrats had voted to restore the mention of God and Jerusalem as the capital of Israel to the party platform. Sources in the room say even the third vote was a no; however, it seems from the video (below) that Villaraigosa was coached to “rule” by a woman who approached him at the podium after his second failed attempt. The first vote is clearly a no. Villaraigosa holds a second vote after saying “All of those delegates who are in favor say Aye!” He puts a strong emphasis on the “Aye!” as if he wants to make sure people understand him. But the second vote is just as close–with a slight, but audible, edge to those voting no. In context, she appears to be telling Villaraigosa to steamroll the delegates and get it done. In any case, that is exactly what happens. “You’ve gotta rule…” is probably not the message Democrats wanted coming out of today’s convention, but it does have a familiar ring. Remember Nancy Pelosi’s statement about Obamacare? “We have to pass this bill so that you can find out what is in it.” In this case, the orders reportedly came from President Obama himself. Ram it through and ignore the majority of folks–at the convention, in America generally–who don’t want it. It’s just the way Democrats do things these days. Update: There’s no longer any room for doubt. 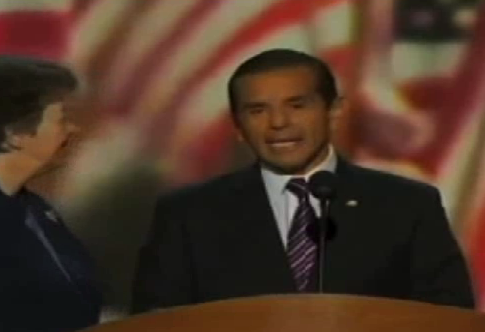 Villaraigosa was not following by the will of the delegates he was carrying out the will of the President. Sean Hannity revealed tonight that the statement approving the vote was on the teleprompter. After the shove from the parliamentarian (and the 3rd vote), Villaraigosa simply read the line saying it was approved exactly as he was supposed to all along.